Fake news correspondent Frank Rarely believes frantic preparations are already in place following Malcolm’s invitation to Trump to pop around. Initial planning for a Trump visit is closely following the protocols already established for dealing with an outbreak of the bubonic plague. Placing Sarah Hanson Young in preventative detention for the duration of his stay is obviously critical to guarantee the President’s safety. Authorities are presently checking a tip-off that she’s already plotting to stow away all the remaining Manus Island asylum seekers on Air Force One for the flight back to the US. There is an interesting contrast of views on how long Trump’s visit should last. Malcolm is said to favour a couple of days while the Greens have proposed between an hour and an hour and a half. McDonald’s is considering whether to add a McTrumpburger to their menu to mark the visit. They would probably develop it in collusion with their outlets in Russia. There is considerable disquiet in Canberra about Trump’s potential influence over Pauline. The government wants to avoid potential conflict with Mexico over payment for a wall along the Queensland and NSW coasts that Pauline is likely to promise to keep out Hispanic illegal immigrants. The police are instigating plans to control anti-Trump demonstrations in all major cities. They are concerned by the prospect of them turning every bit as feral as happy hour on cruise ships. In view of their chronic inability to give a fair and balanced view of anything, least of all Trump, the government is considering whether to ban all ABC news and current affairs programmes during his visit. 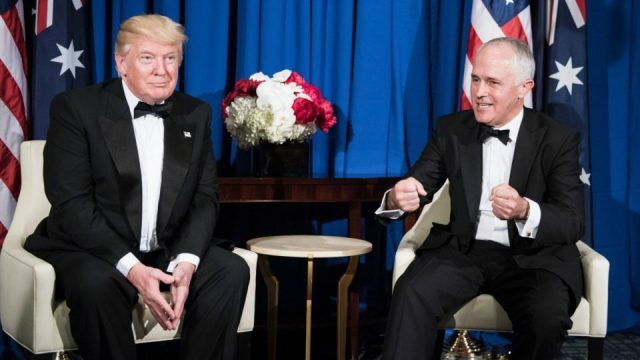 The ABC has responded by offering to run a fair and balanced Q&A featuring Trump and Kim Jong-un and a plan to transfer Emma Alberici to forecasting weather rather than economics. Prospects of Barnaby forming a Trans-Pacific Partnership with Trump have been superseded by his Transformative Partnership with Vicky. This promises to give birth to something much more worthwhile than anything he could possibly produce with Trump. There is a strong view among security chiefs that as a courtesy Trump should be informed in advance that he’s not considered a suitable person to purchase a gun in Australia. Malcolm has still to decide whether this should be a state visit or whether a visit to the Northern Territory would be more appropriate. Following intensive discussions with the UN the Immigration Department are still to determine their response to Melania if she applies for political asylum in Australia. Meanwhile it is instructive to note that while Trump is easily the most unpopular politician in the world, his approval rating in the US is higher than those currently enjoyed by Malcolm and Bill in Australia.